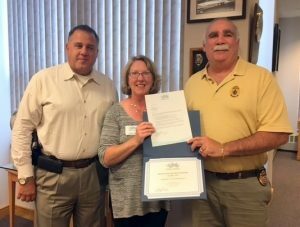 The Greater Haverhill Chamber of Commerce is proud to distinguish the Haverhill Police Department as the Chamber’s Business of the Month for September 2016. This distinction is awarded to the HPD based on their continuous maintenance of the community, dedication to working closely with neighborhood groups, schools, churches, social service agencies and local businesses in an effort to keep the Haverhill safe and attractive to new business and relocating citizens, and most importantly, for the support and manpower provided during the Chamber’s downtown festivals and outdoor events. The Haverhill Police Department, under the management of Chief Alan DeNaro, currently has 200 sworn officers in the police and fire departments. Haverhill encompasses a geographical area of 34 square miles with a diverse population of 65,000 citizens. Using the most modern equipment, technologies and up to date training keep HPD one step ahead of some of their neighboring departments and accounts for the highest levels of safety and protection here in Haverhill, something we all enjoy. Business of the Year award. That honor is announced during the annual breakfast which has been scheduled for February 2017.